Spidey may have webbed up two of the top six comic selling spots in August, but that didn't stop Multiversity #1 screaming into position #4. Proving Grant Morrison writing anything draws a crowd (and deservedly so), the debut wasn't enough to stop publisher DC from been beaten by Marvel in terms of unit share, by 3.29%. Now, on to the Top 6! 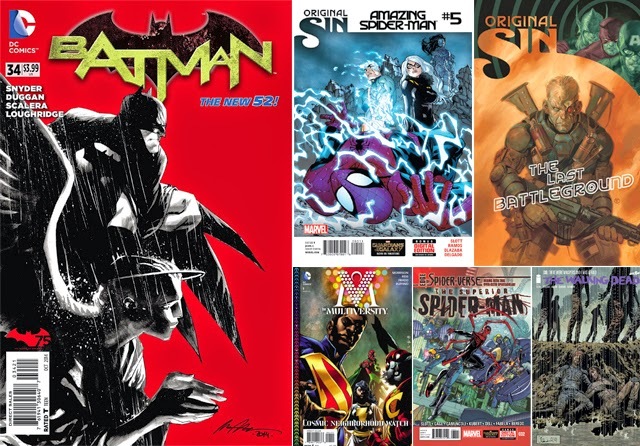 THE TOP 6 COMICS FOR AUGUST 2014: 1) BATMAN #34 2) Amazing Spider-Man #5 3) Original Sin #7 4) Multiversity #1 5) Superior Spider-Man #32 6) The Walking Dead #130 - Full stats after the jump. MY THOUGHTS: Multiversity makes me think that Elseworlds could easily return at DC and do well. Multiversity's light attachment to the DC52 is almost as an attractive proposition as its concept, creative teams or character line-up. If fans are flocking to this story of alternate universes, the DC classic brand that made on a name on telling the same, could easily follow suit. TOP COMICS OF AUGUSTS PAST: Writer Brad Meltzer helped put Black Canary in the A-league in Justice League of America #1. Like Multiversity, Justice took the DCU's best to alternate realities and sales success in 2005, while speaking of glory days, in 1997, Spawn #65 held the top spot. I think I'd like an alternate reality where the comic book publishers have drastically changed all the continuity in their comics. To what ours used to be. Then I want to move there. I'm with you Random. And I'd bring the club feeling back to Marvel too. You know, with things like Bullpen Bulletins and those little checklists. OH man. I miss the checklists. Thanks Dale. I'm hoping upcoming rumours of a DC Crisis will delete the 52 guff and reinstall that pre era!